Lord Sorin Wincanton fled England’s shores to avoid temptation in the form of Lady Eleanor Cramley, but upon his return from fighting Bonaparte, the impetuous young miss he escorted through her first Season has grown into a stunning woman who still fires his blood. She sees him as a beloved older brother, and that’s the way things need to remain for the sake of her reputation. Eleanor was devastated when Sorin left her after scolding her for her wild ways. During his long absence, she’s striven to mold herself into the proper lady he urged her to become. Now that he’s back, however, the gentleman who once served as her chaperone makes Elle long to toss all proprietary to the wind. And now she only has til Season’s end to prove to him that they’re perfect for each other - or face an unacceptable bridegroom. I instantly liked both Sorin and Eleanor. Sorin is kind, strong and can be abrupt, but only to hide his feelings. Eleanor is smart, independent, and wise beyond her years because of the loss of her parents at a young age. Together the conversations are quick, sometimes witty and yet often filled with misunderstandings that started to wear on me. The secondary characters were interesting and caring. I was a little sad to see Eleanor’s best friend suffer the same constant misunderstandings for her own HEA. Eleanor’s cousin and guardian, the heir after her father, the duke passed, and his duchess were caring, and loveable. I was disappointed that the author started to give Eleanor the social assistance of Sorin’s mother, but her role was not developed enough to really give her the due and the power that was alluded to. This was a new to me author and the blurb was intriguing. Unfortunately, I was not as excited as I got into the book. Yes, the characters were endearing and their plight was fair but the author did them a disservice by not giving them more of a challenge then just their thoughts, misunderstandings and wish to not hurt the other’s feelings. The only antagonist, while a vile man, did not pose enough of a struggle to truly bring them together as a couple to solidify their HEA. Yes, he was a bully and his pride had been hurt as a young man, but both Sorin and Eleanor only thought to confront his separately until the very end and that was disappointing. There were so many chances to bring them together and they were glossed over. While the constant missed chances were wearing on me, I still enjoyed the characters and will give the author another read. This was a 3.5 star book for me. Sorin Latham, the Earl of Wincanton has come home after years away. He has been very successful in repairing the family fortune, but that was not the main reason he left. Lady Eleanor Cramley is overjoyed that her cousin's best friend has returned. He holds a special place in her heart, and has for years. Her family is determined to see her married this year but the very high standard she has set is unlikely to be met. There is an unscrupulous fortune hunter that refuses to take no for an answer. A sweet regency romance full of misunderstandings and strong friendship. A gentle, entertaining story. I thoroughly enjoyed it. 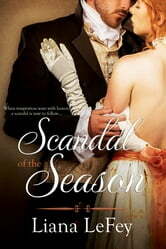 'Scandal of the Season' by Liana LeFey is the story of Lord Sorin Latham and Lady Eleanor 'Ellie' Cramley. Ellie has know Sorin most of her life since she has been living with her cousin and his wife. Sorin his their neighbor and has been Ellie good childhood friend. But it seems that things started to change with Sorin returned home when Ellie was 16 years old. Ellie ran to him like she always had but Sorin pushes her away. Later he tells in that she is a lady now and that she has to start acting like one. That same year when Ellie is to have a season Sorin is asked to take her since her cousin and his wife are getting ready to have a baby. Sorin doesn't last long during that Season before he ups and leaves her with to lady matrons. After that he didn't return until 5 years later ...the present day. Sorin shows up and Ellie birthday party and he finds a totally different Ellie then the free girl getting into trouble. Ellie is trying to become the Lady that Sorin says she should. Although she hasn't seen Sorin in 5 years she has been writing him. When Ellie see Sorin again she find him so very handsome. This was a joy to read and watch how these two moved past being childhood friends to becoming something more. Sorin is somewhat uptight I though with his thinking, but overall loved this story. "My honest review is for a special copy I voluntarily read." This had all the charm and "sighs of contentment" moments that I expect in an outstanding historical romance novel. Ellie has no intentions of settling for an unacceptable and undesirable suitor, when she could possible have the man she has always longed for, a man who has also hurt her deeply. Sorin once fled England to resist the temptation that is the lovely Ellie. But, now, he's back. And, Ellie is on a mission to make him see what he once left behind. I loved the juxtaposition of Ellie trying, desperately, to get Sorin to lose his heart to her, while he fights, just as determinedly, to keep her from stealing it. Both characters are feisty and stubborn and play well off of each other. *I received a complimentary ARC of this book from NetGalley & Entangled Publishing, LLC in order to read and provide a voluntary, unbiased and honest review, should I choose to do so.